Hi I am new here. Right now, I am not working on anything. Once the holidays are over, I plan to crochet a baby afghan for a coworker. She is due in April. I’m sure I can finish it before her due date. I will post pics of it before I wrap it for her. She is having a boy, so……I will be using blue and white. 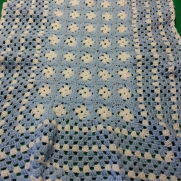 This will be the 5th baby afghan I’ve crocheted over the last 3 years….. Unfortunately, I have not taken pictures of most of them. I will find the one(s) I have and post them after Christmas, though.